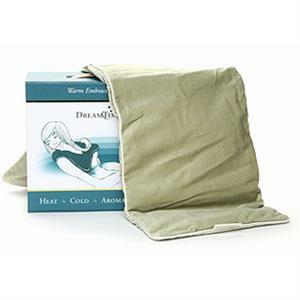 DREAMTIME'S Warm Embrace Body Wrap caresses your body with warm or cool cozy comfort and transforms everyday stress into a sense of well-being and relaxation. The Body Wrap imparts a healing warmth or cooling touch that comforts the body and soul, while the exclusive fragrant fill of cinnamon, clove and eucalyptus soothes the senses. Its generous size and shape lets you blanket any body area in need of nurturing while the luxurious velvety fabric elevates your experience to absolute bliss. Wrap yourself in DreamTime’s Warm Embrace and get carried away to a world where relaxation is the rule. Size 28” X 9”. Makes a beautiful and gift for friends and family. Heat therapy encourages circulation, and may be used to help ease headaches, muscle tension, stress, or arthritic pain. Cold therapy may be used to help temper headaches and reduce swelling associated with sports injuries. Colors: See available colors above. 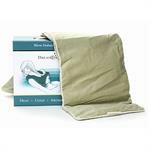 Click here to view more products from DreamTime. Heat Therapy: Microwave on a clean plate for 30 seconds. If more heat is required, heat in 30 second increments, with 30 second standing time in between. Total heating should not exceed 2 minutes. Do not overheat. Do not leave unattended while heating. Always check the temperature before using. The Wrap should feel warm to the touch, not hot to the touch. Cool Therapy: Seal in a plastic bag and place in a freezer overnight. May be kept in the freezer until ready for use. Cleaning Instructions: Remove cover and machine wash in cold water, on DELICATE cycle. Tumble dry on LOW and remove promptly. Or can be washed by hand and hung to dry. Do not allow grain filled inner pillow to get wet.